It’s no secret that exposure to the natural environment offers incredible health benefits, including improved mood and memory, stress reduction, and increased general wellbeing. With that in mind, Shearwater’s unique design has made it easy for residents of all ages to connect with both nature and community through an expansive trail system that weaves through neighborhoods and breathtaking wilderness. Shearwater’s winding trails are nestled within a preserved forest, creating a scenic backdrop for hiking, biking or a pleasant stroll. According to scientific research, spending just 15 minutes outdoors can generate enormous health benefits. That’s great news for Shearwater residents, as abundant opportunities to connect with nature lie just beyond the doorstep of every home. Upon completion, Shearwater will provide more than 13 miles of trails, 600 acres of preserved habitat, and direct access to Trout Creek. Located just a short distance from the Kayak Club, the North Trout Creek Trail will feature a charming park with a new Tot Lot and picnic pavilion. A boardwalk will lead to a scenic overlook, offering spectacular views of the headwaters of Trout Creek. The Kompan Tot Lot features natural wooden materials that blend seamlessly into the beauty of the surrounding forest. Kompan has been a world leader in the development of children’s play equipment for over 40 years. Their corporate philosophy is based on three core pillars: Health, Learning, and Environment. Children can explore the ropes course, balance beams, spring riders, swings, seesaw and swing basket. 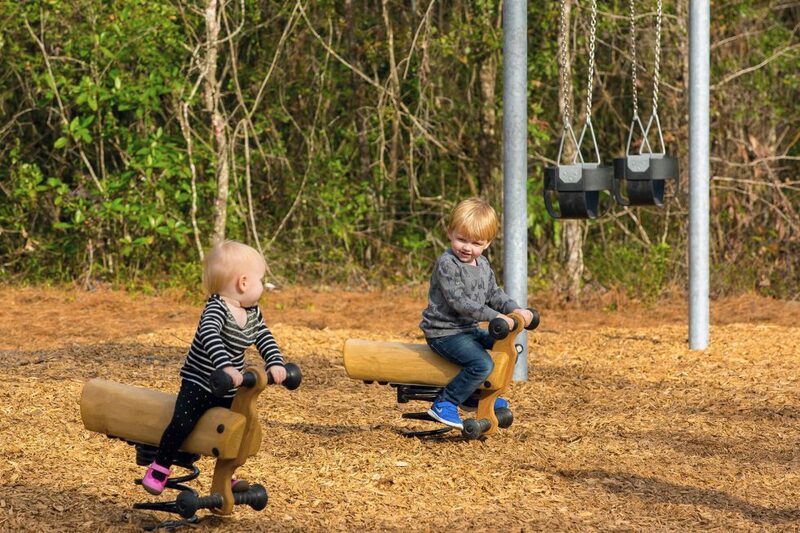 Freehold Communities chose to partner with Kompan playground equipment based on its adherence to high safety standards, sustainable design, and enduring quality. The Tot Lot provides a place for children to have active social play while parents enjoy the natural scenery, benefiting both their physical and mental health. Within walking distance of most Shearwater homes, the Tot Lot provides a great option for birthday celebrations, play dates, and family picnics. Ready to live a happier, healthier life? Expose yourself to the natural joys of the outdoors at Shearwater. Stay connected with the Shearwater lifestyle by joining our Founders Club to receive updates and event invitations.